The British establishment’s understanding of Ireland has long been delusional and dysfunctional – now combined with Brexit and Theresa May's dependence on the DUP to cling to power, it’s creating a powder keg. 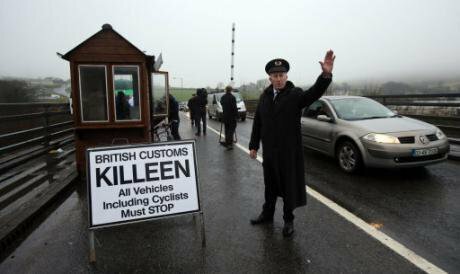 A mock customs point set up in County Louth to protest Brexit concerns. Niall Carson/PA, all rights reserved. Brexit has become a constitutional and political clusterf*ck - a rolling embarrassment for Britain in a show set to run officially at least until 11pm on 29 March 2019, and probably for years after. It is a crash between a right-wing Fantasyland version of Britain (witness Boris Johnson, Liam Fox and Jacob Rees-Mogg) and at the margins, a left-wing British exceptionalist story led by Corbyn which hopes, by keeping quiet, to pick up the pieces. And it’s all based on ignorance of history and the hard realities of politics and diplomacy. Nowhere is the Brexit debacle clearer than in relation to Northern Ireland and Ireland, and the boundary between them that emerges after the UK leaves the EU. This has huge consequences, as the three areas the EU prioritised for initial agreement with the UK are the border, the rights of EU citizens and the monies the UK will pay to leave. This will all come to a head at the EU summit on 14-15 December, with the UK Government’s pursuit of a hard Brexit - leaving the single market and customs union - meaning that the current porous border is under threat. A hard Brexit could lead to a hard border. UK ignorance of Northern Ireland is embedded in British politics and culture. This is despite the profile and pains of Northern Ireland’s thirty-year civil war, known as ‘the troubles’, which spilled over onto the mainland; and the long and difficult attempts by UK Governments to barter a settlement between unionists and nationalists in Northern Ireland. it allowed the North’s status to be guaranteed by the UK and Ireland and via the ‘consent principle’ (by which no change could happen to the North’s constitutional status without majority support); it reassured both unionists and nationalists and created a series of North-South institutions which shared and pooled sovereignty in the North between the UK and Irish Governments. This was flexible, imaginative and far-sighted politics on behalf of London and Dublin. It has stood the test of time, brought untold benefits to the North (as well as to the UK and Ireland), and is being put at risk by Brexit. If that were not enough, UK ignorance of Northern Ireland is combined with witlessness and condescension about Ireland. Irish history is barely known in the UK, even in senior British political circles. The facts of British brutal rule, colonialism and repression that did so much to create the Irish movement for independence, are barely known or acknowledged. Take the repeal of the Corn Laws in 1846 - the delay of which caused the Irish potato famine, starvation and thousands of deaths, as well as mass migration. None of this is really remembered, even when there is a parallel with Brexit - the debate then being about free trade versus protectionism, bitterly dividing the Tories, and throwing them out of office for thirty years. And Kate Hoey - Labour MP for Vauxhall, leading Brexiteer, born in Northern Ireland - said on the Today programme on Monday about a hard border: ‘If this ends with a no deal we won’t be putting up the border, they’ll [the Irish Government] have to pay for it because it doesn’t need to happen.’ Shame about the Trump Mexican wall overtones. The current British political class seem to have next to no understanding that, in the period since both the UK and Ireland joined the then EEC on 1st January 1973, Ireland has been the UK’s closest ally, advocate and interpreter in EU corridors of power. The last twenty years of UK-Irish relations, of which the Good Friday Agreement is but one part, have also been the most harmonious between the two states since Irish independence in 1922. The backdrop of both countries being in the EU has been a part of this. All of these benefits are now under threat and cannot just blithely be assumed to continue unharmed into the future as the most nonchalant Brexiteers claim. UK politicians and media feel free to comment on Irish politics and politicians, such as Taoiseach Leo Varadkar, in ways unhelpful and lacking subtlety. There seems to no awareness that such comments are read in Irish circles and factored into their responses. The Spectator’s Political Editor James Forsyth wrote at the end of last week, without a hint of irony, that: ‘If British politicians talked about a majority of the Irish electorate the way Varadkar does about Brexiteers, they would rightly be chastised.’ It does make you wonder where a Westminster watcher like Forsyth has been since the Brexit vote. What drives this delusion and derision towards all things Irish? One major factor is the powerful myopia at the heart of the UK. The British political establishment barely understands the complexities, composition and character of the UK. This lack of understanding has a long history but it’s now becoming a chasm that is vitally important to how Brexit pans out. The British story that has come to the fore since leave won the EU referendum is a Ladybird version of British history. It sees the UK as the historical good guys (which doesn’t exactly square with empire) - with Brexit offering a liberation from the shackles and constraints of Brussels and a return to a modern form of buccaneering, all-conquering capitalism dominating the waves through free trade, charm and soft power. This set of combustible factors is combined with problem contemporary politics. It is a bit rich for British politicians to rail against the current Irish and German governments, calling them weak and divided, saying that recent election results have weakened them and their room for negotiation, and that new elections may be imminent. Are they really talking about the Irish and Germans or, are they unwittingly referring to the current wounded, limp and lifeless UK Tory administration as it staggers on? The Democratic Unionists can cold shoulder power-sharing with Sinn Fein because they are power-sharing with Theresa May’s Conservatives, and doing rather well out of it. The recent DUP conference saw Tory chief whip Julian Smith address the gathering, while Deputy Prime Minister Damian Green spoke at a related DUP fundraiser. It wasn’t surprising that Green was also party to attempts in the summer, once the Tory-DUP deal was signed, to get the DUP a special adviser (first paid for by the taxpayer, then from Tory funds) with such plans being blocked by civil servants. The British Government approach to Brexit has so far been to overplay their own hand and misunderstand the EU, EU 27 and Ireland. The Irish Government’s stance on the border reflects public opinion, but more critically, a collective Irish sense of history and identity. They didn’t bring about this situation. It isn’t their mess to clean up. That means they don’t have to bend themselves into contortions and trash their principles to come up with a solution. There doesn’t need to be an Irish veto on 14-15 December or a future EU summit, because the entire EU 27 stand united and in solidarity, saying no to a hard border. It is up to the UK Government to bring forward solutions. So far it has produced one flimsy paper touting such things as electronic tracking. Only a tiny minority of UK public opinion wants a hard Brexit - 11% on the latest Kantar poll. 55% think the UK Government is making a hash of Brexit; 21% think it is doing a good job. 64% don’t think the UK Government has a coherent position - and they are right. Despite this, British public unease isn’t properly expressed because of the ambiguity of Labour’s position on Brexit. Brexit is the single biggest constitutional and political crisis the UK Government has faced since the end of the Second World War, and it is entirely an act of self-immolation. It is also the greatest crisis the Irish Government has faced since the 1920s, but one where the Irish have through the EU not just the moral high ground, but political leverage and power. We have to hope they get it right, and are better at this than the Brexit vandals running the UK Government. On this the Irish speak not just with the backing of the rest of the EU, but millions of British citizens who cannot believe the car crash unfolding. We deserve better than this from our politicians of all persuasions, and we have to make sure that we do not let them away with this.